Metal Separators For Injection Molding – Foremost Machine Builders, Inc.
Injection molding machines need to be protected from metal contamination especially where the raw material enters the machine in front of the material in-take. This is your last opportunity for keeping foreign metal material from entering the machine. Demand on the metal separator is high in these situations. Not only must the metal particles be separated from a free falling stream of material, they have to be separated at the same time the injection molding machine is being filled. Secondly, metal particles have to be detected even as the column of material is slowly settling. For metal detection to even take place, it is best to detect metal that is slowly moving through a magnetic field. The problem is that the slower the material moves through the magnetic field, the lower the sensitivity will be. To compensate for this, our metal separators are equipped with specially developed software that can ensure a relatively high degree of sensitivity regardless of how fast the material moves through the magnetic field. With an installation height of only 220 mm , our compact metal separator is ideal for those situations where space is restricted. Using a newly developed compressed air separation technology, our compact metal separator is fast and powerful . Using two powerful nozzle to shoot the material and the metal out of the material column inside a connected tank, this solution saves on space and maintenance costs. When the conditions are right, using compressed air is an inexpensive way to eliminate malfunctions caused by metal contamination. Learn more about our comrpessed air metal separators. We offer two compressed air metal separators: 1) a compact digital metal separator that detects the metal as it passes through a magnetic field which generates an electrical impulse that triggers a powerful stream of air pressure that blows out the contaminated metal and 2) a compact digital metal separator that offers higher levels of sensitivity and reliability than standard metal detection solutions. 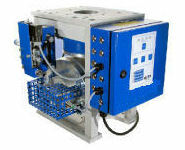 Injection Molding Machines in Confined Spaces. With an installation height of only 220 mm , our compact metal separator is ideal for those situations where space is restricted. Using a newly developed compressed air separation technology, our compact metal separator is fast and powerful . Using two powerful nozzle to shoot the material and the metal out of the material column inside a connected tank, this solution saves on space and maintenance costs. When the conditions are right, using compressed air is an inexpensive way to eliminate malfunctions caused by metal contamination.